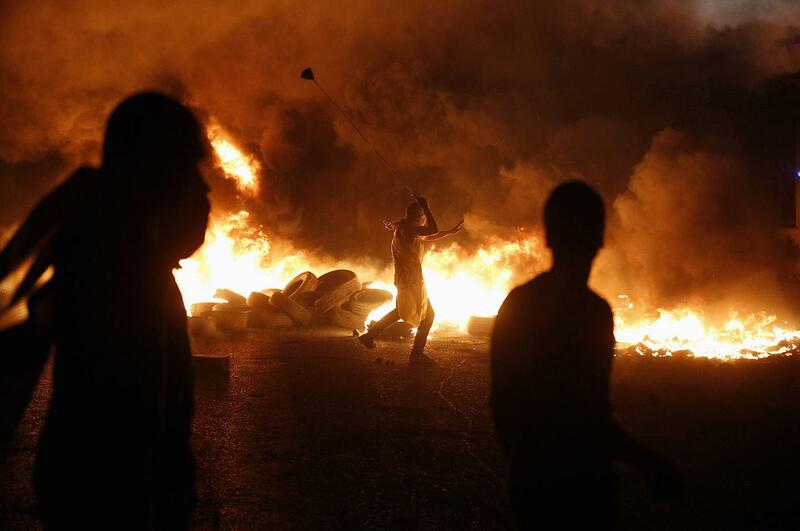 Photos from the Israeli-Palestine conflict in Gaza. 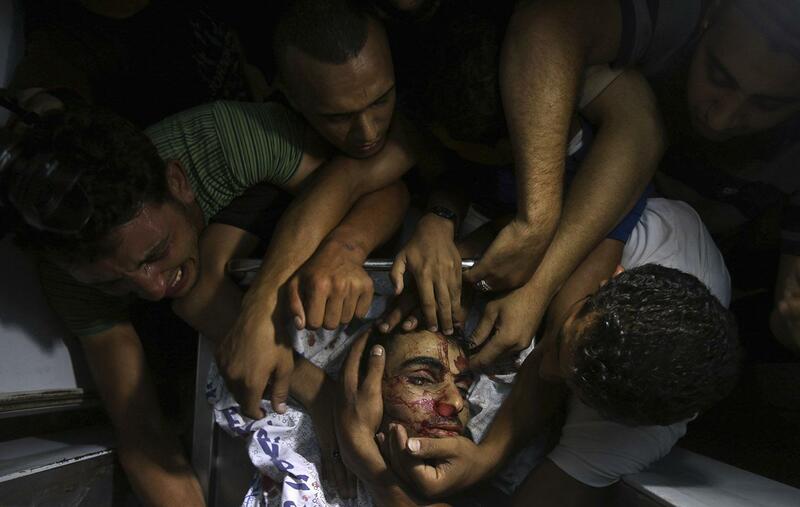 Gripping images of Gaza under siege. With the latest conflict between Hamas and Israel now in its third week, diplomatic efforts have failed to bring anything more than brief pauses in the fighting. The death toll of the conflict is nearing 800, including 32 Israeli soldiers, but the vast majority of the casualties have been Palestinian civilians. The photos below vividly show the human toll of the conflict. Update, July 28, 2014: This post has been updated with additional photos. 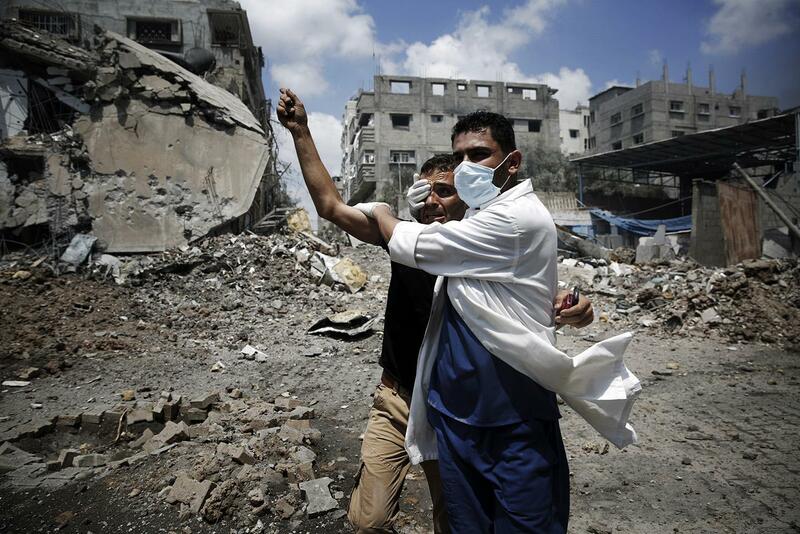 A medic helps a Palestinian in the Shejaia neighborhood, which was heavily shelled by Israel during fighting, in Gaza City on July 20, 2014. 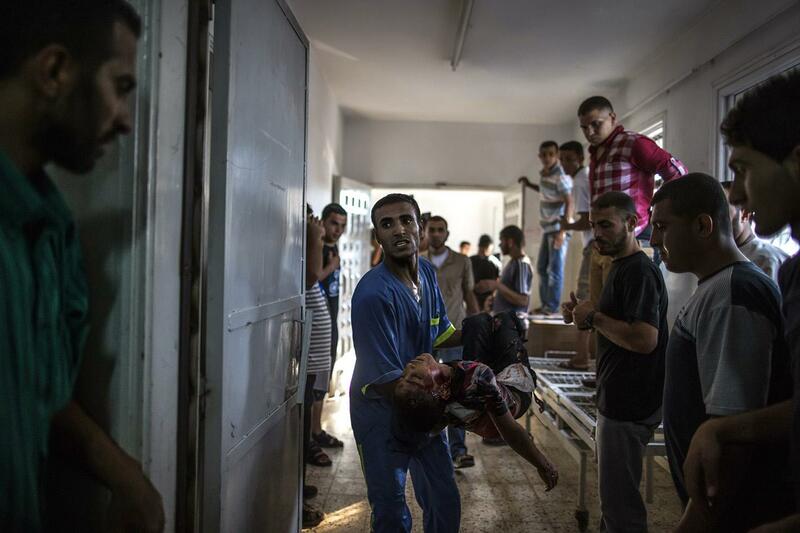 A Palestinian medic carries the body of a child, killed in an explosion in a public playground on the beachfront of Shati refugee camp, in the morgue of Al-Shifa Hospital in Gaza City on July 28, 2014. 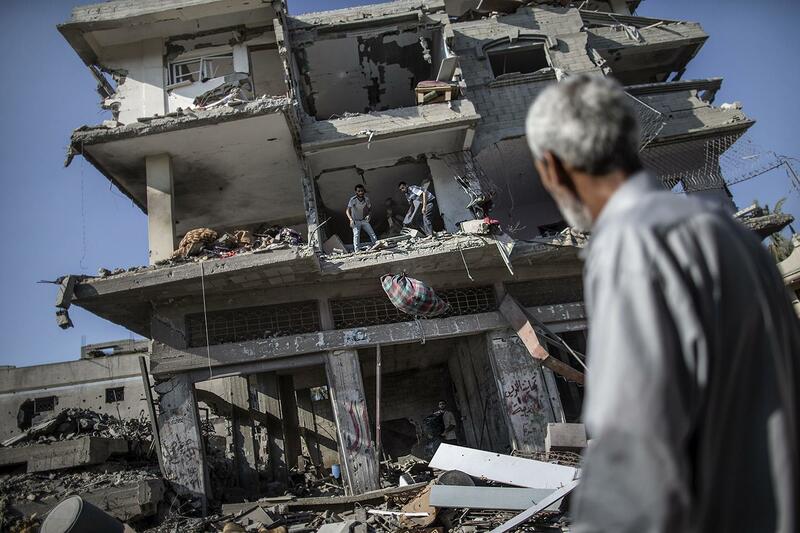 A Palestinian man looks at people collecting items and belongings they found in the rubble of a destroyed building on July 27, 2014, in Gaza City. A protester uses a slingshot to hurl stones toward Israeli troops during clashes at a protest against the Israeli offensive in Gaza at Qalandia checkpoint near the West Bank city of Ramallah on July 24, 2014. 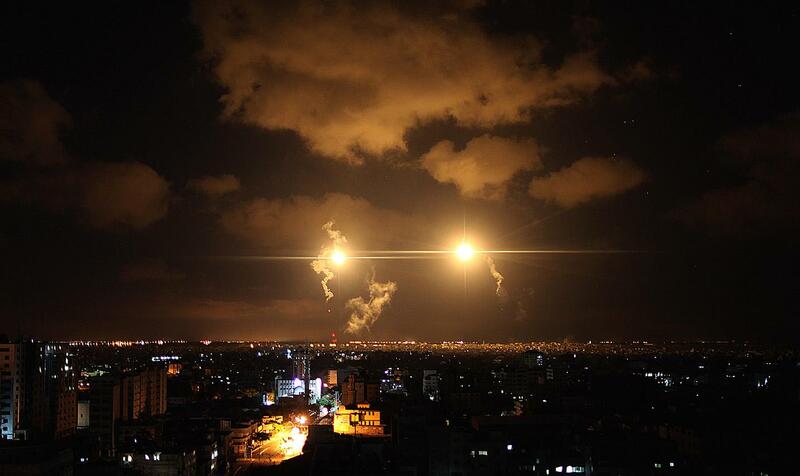 Aircraft flares illuminate the sky following an Israel airstrike over Gaza City on July 18, 2014. 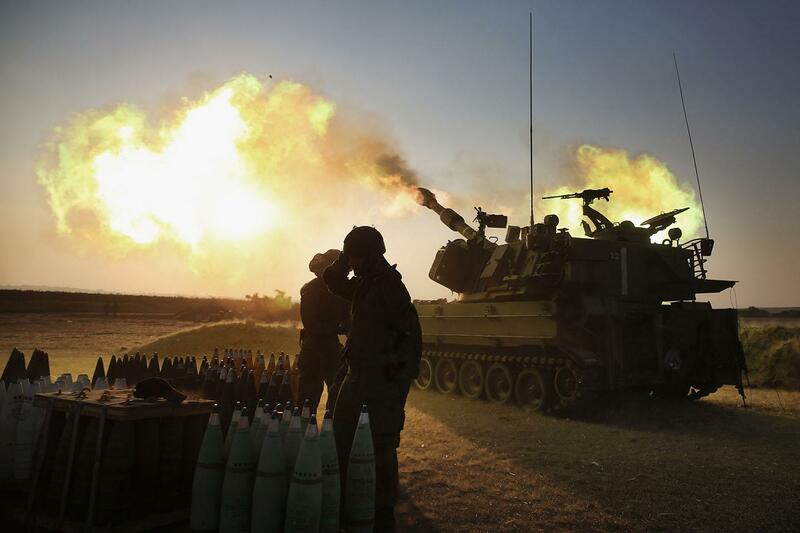 Israeli soldiers fire 155-mm artillery cannons toward the Gaza Strip from their position near Israel’s border with the coastal Palestinian enclave on July 21, 2014. 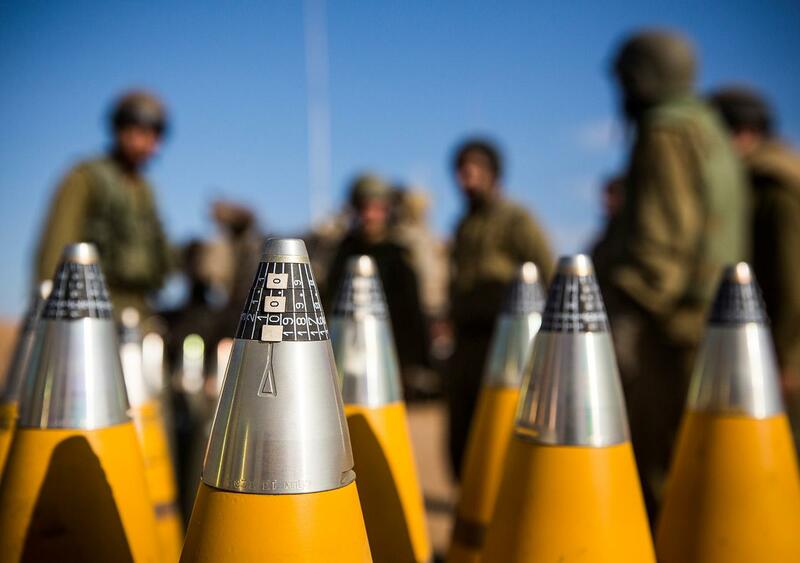 Israeli artillery shells sit waiting to be fired into Gaza on July 17, 2014 near Sderot, Israel. 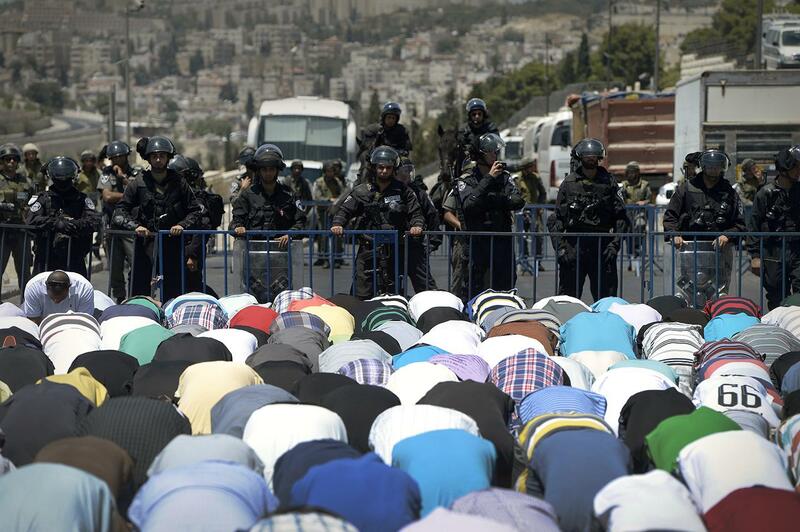 Palestinians perform Friday prayer on the street, outside the Al-Aqsa Mosque after Israeli police barred under 50 years Muslim worshipers from entering the holy site on July 20, 2014. 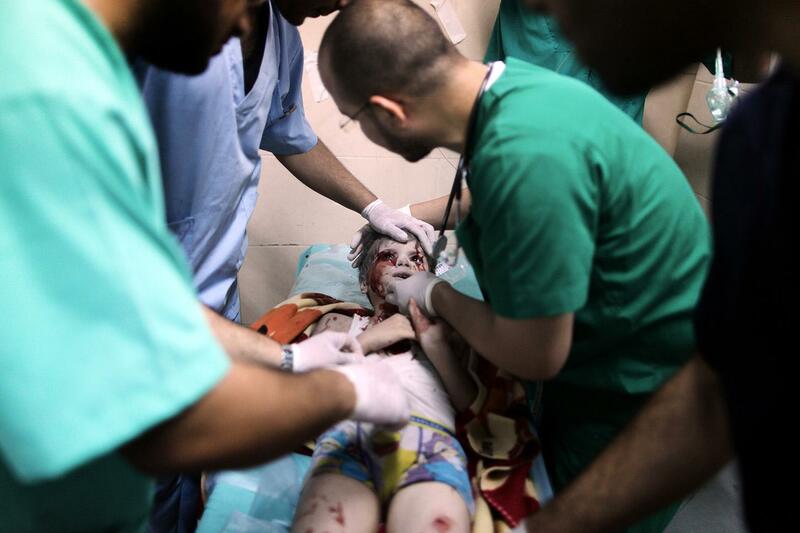 Doctors treat a Palestinian kid, who was injured in an Israeli attack and taken to Al Shifa Hospital in Gaza City, Gaza on July 20, 2014. 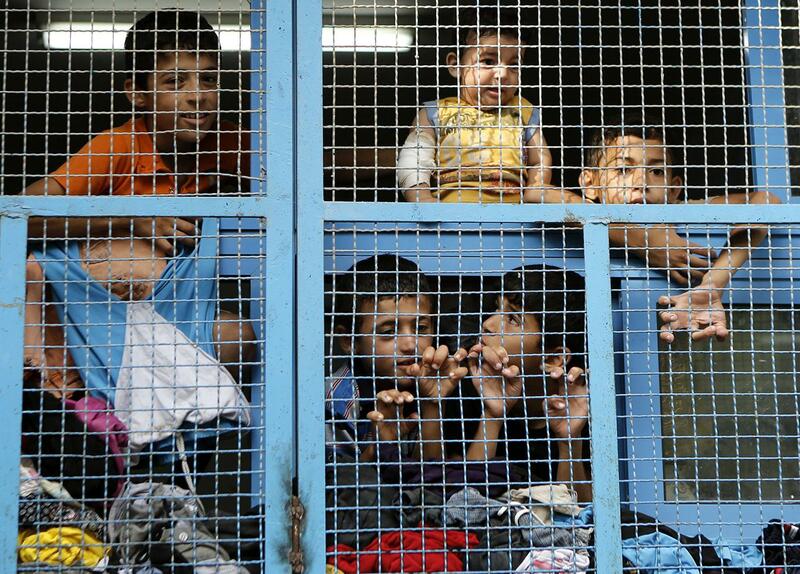 Displaced Palestinian children from Beit Hanun in the northern Gaza Strip stand behind the window of a classroom on July 23, 2014 at a UN school in the refugee camp of Jabalia where displaced families have taken refuge after fleeing heavy fighting in the Gaza Strip. 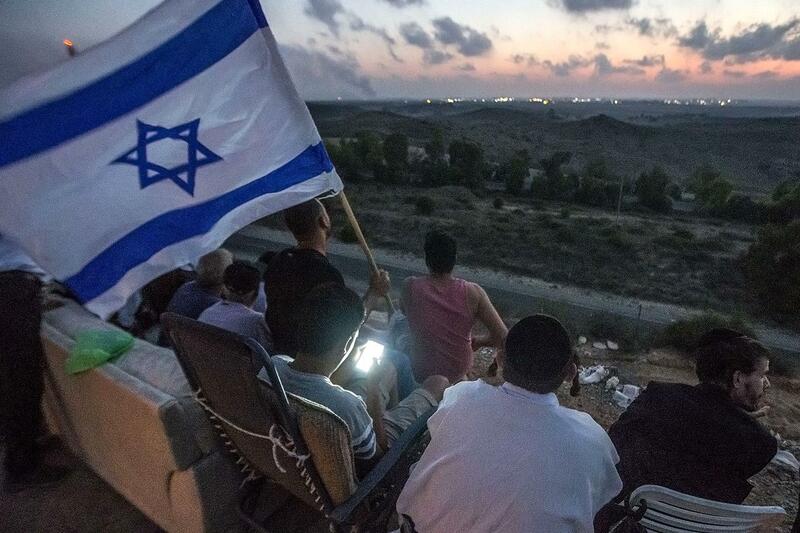 Israelis, mostly residents of the southern Israeli city of Sderot, one holding a national flag, sit on a hill overlooking the Gaza Strip, on July 20, 2014, to watch the fighting between the Israeli army and Palestinian militants. 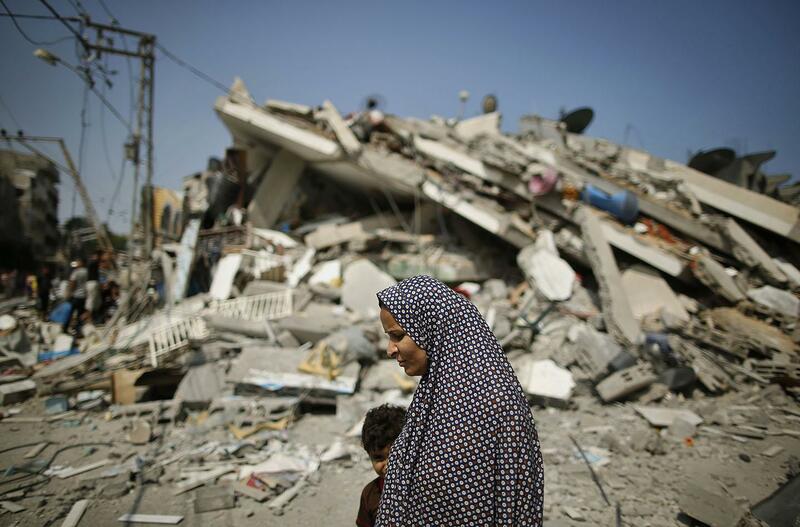 A Palestinian woman walks past the rubble of a residential building that police said was destroyed in an Israeli air strike in Gaza City on July 22, 2014. 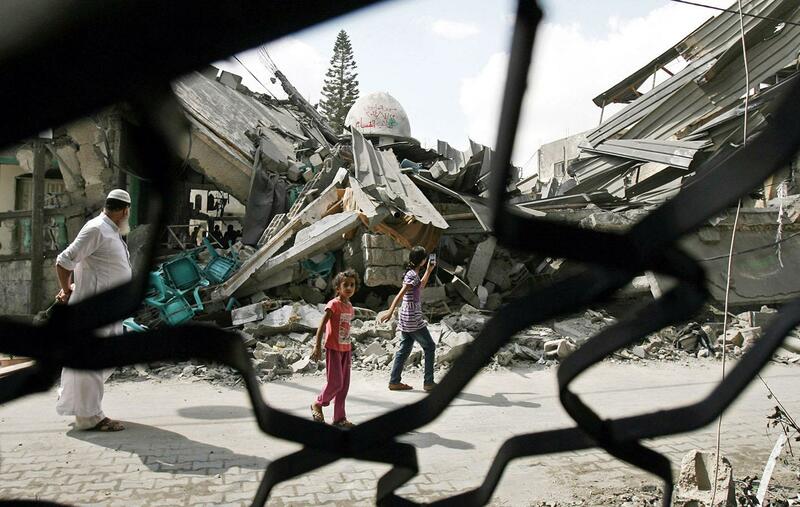 A Palestinian man and children are seen near the ruins of the Al Farouk Mosque in Rafah, Gaza, on July 7. 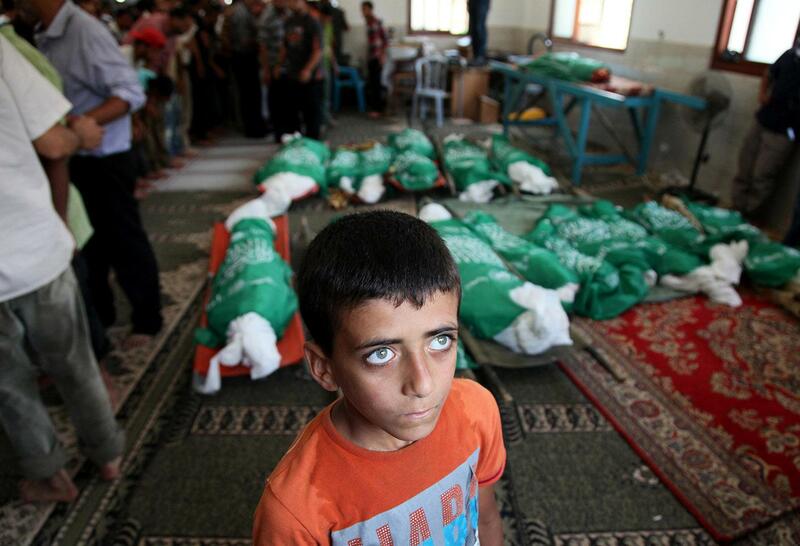 A boy attends a funeral ceremony held for more than 20 members of the Abu Jameh family killed after an Israeli airstrike hit their house in Khan Yunis, Gaza, on July 21, 2014. 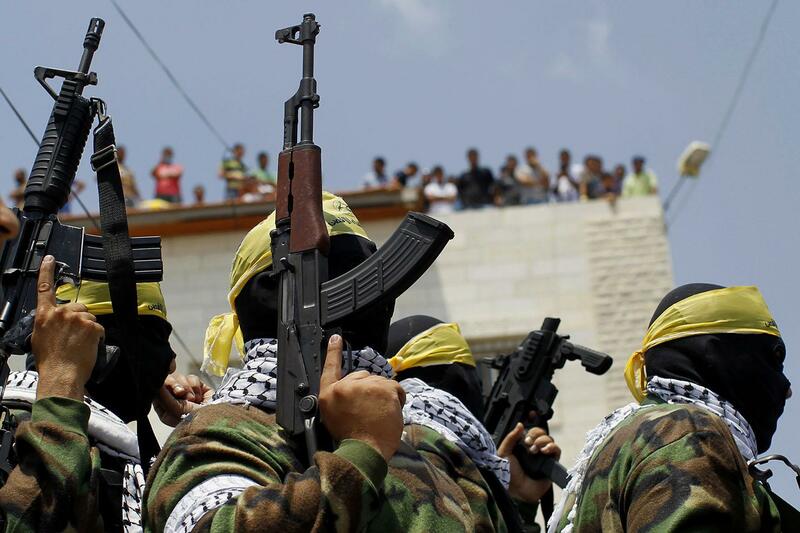 Palestinians watch a procession of Fatah movement members holding their weapons during the funeral of 21-year-old Mahmud Shawamreh in the West Bank village of al-Ram, just west of Jerusalem, on July 22, 2014. 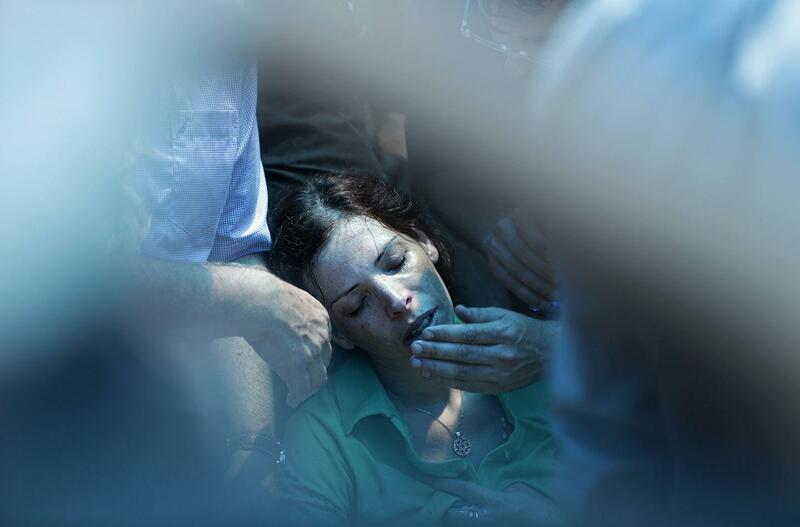 The sister of Israeli soldier Tsafrir Bar-Or, killed in a firefight in Gaza on July 20, 2014, mourns during his funeral in Holon, Israel. 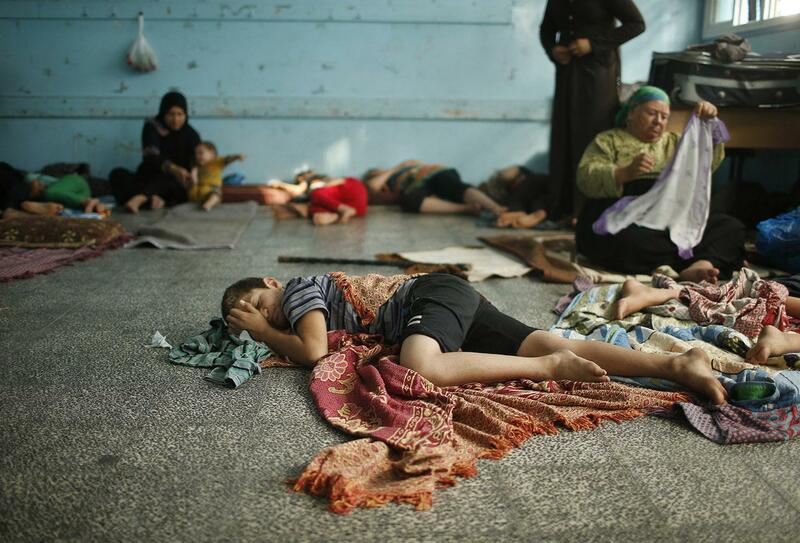 A Palestinian boy, who fled his family home in the northern border town of Beit Lahiya, sleeps at a United Nations–run school in Gaza City on July 14, 2014. 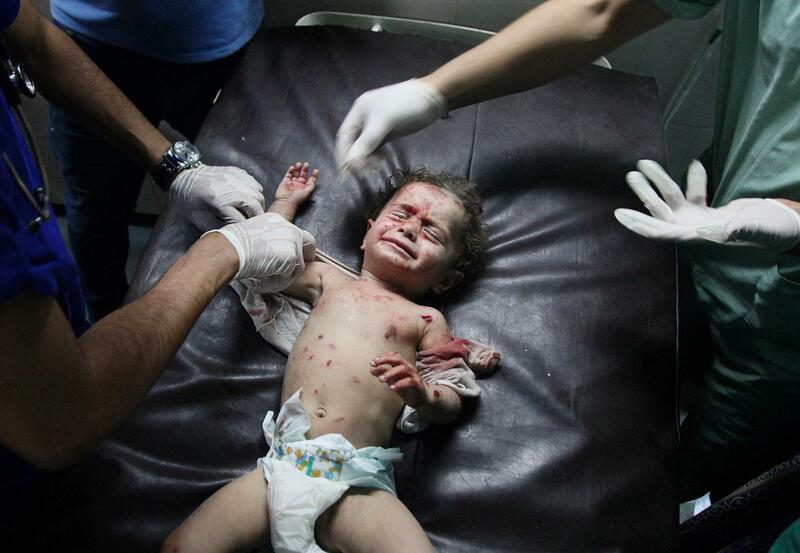 A Palestinian baby, injured in an Israeli airstrike, receives treatment at Al Shifa Hospital in Gaza City, Gaza, on July 18, 2014. Relatives comfort Moeen Qishtah, the father of a 9-year-old Palestinian girl who was critically injured in an Israeli airstrike on July 22, 2014, at the Kamal Adwan Hospital emergency room in Beit Lahia, Gaza. 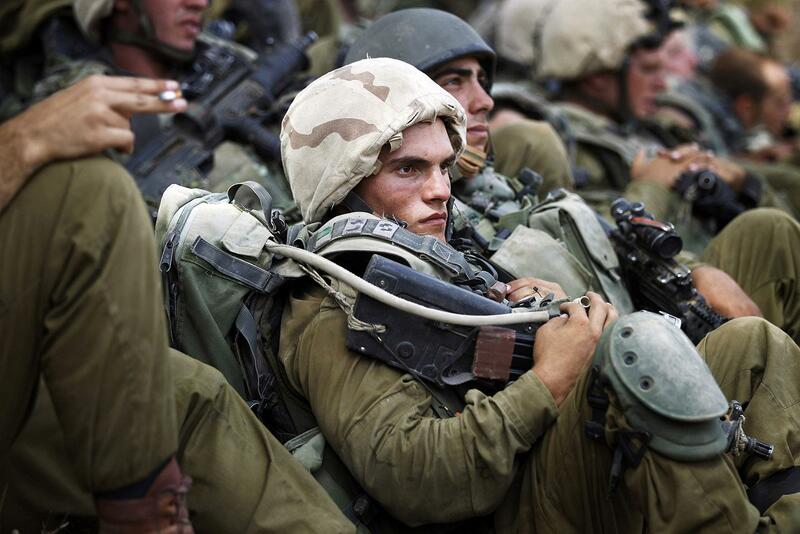 Israeli soldiers from the Nahal Infantry Brigade in central Gaza on July 12, 2014. 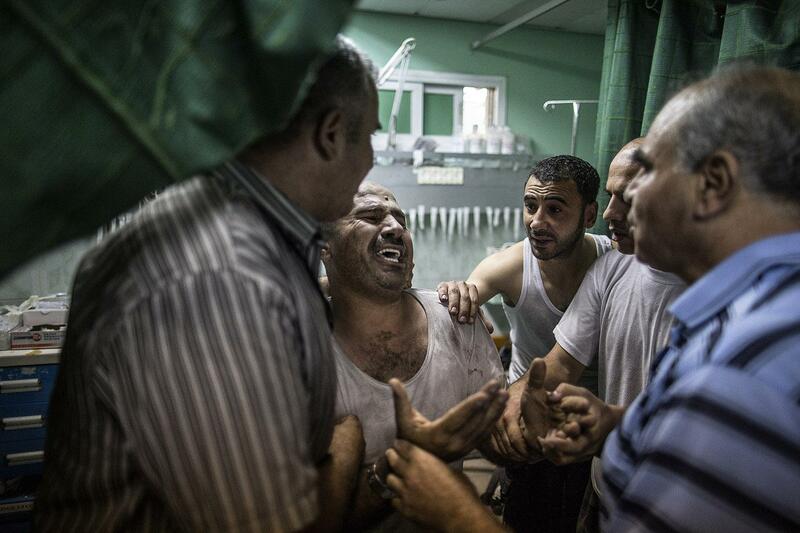 People mourn around the body of a Palestinian militant at a hospital morgue in Gaza on July 6, 2014. 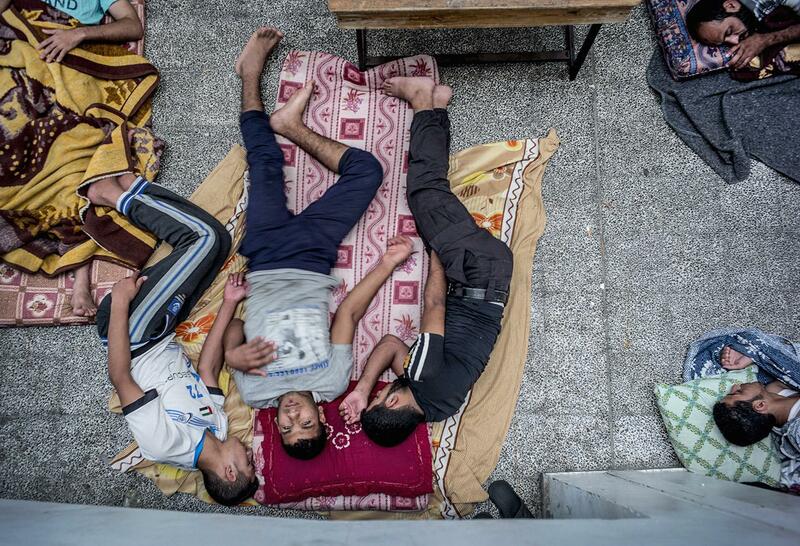 Palestinian men rest as dozens of displaced families from the northern Beit Hanoun district of the Gaza Strip take refuge at a United Nations–run girls’ preparatory school in Jabalia on July 23, 2014.